A heavy-duty mortice latch for use with any of our 'unsprung' level latch handles or 'unsprung' knob sets. A heavy duty spring is incorporated into the latch to allow heavy handles to 'spring' back into the horizontal position. An ideal latch for internal doors, comes with black plates to suit any of the black furniture suites. 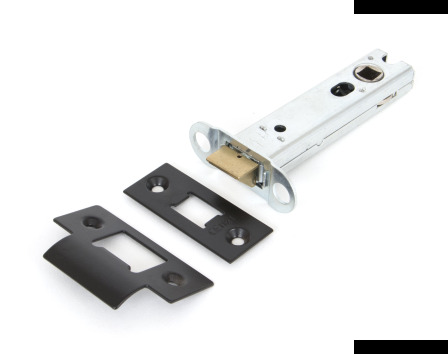 This latch is reversible and can also be used on 30-60 minute fire doors.